Graisins(Image via Elanso)The graisin (or giant raisin) is a raisin which has been genetically re-programmed to grow far beyond its normal size. It was produced by Japan__s National Institute of Genetics. And while they taste exactly the same as small raisins, they are freakin’ huge, and could beat the crap out of normal raisins in a street fight. 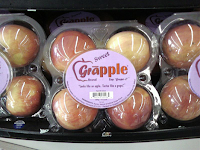 Grapples(Image via Wikipedia)Originally funded by UNICEF and created for Third World aid efforts, a grapple is simply a genetic cross between a grape and an apple. The fruit keeps the size and shape of the apple, the texture of the grape, and the flavor of both while providing a potent, high-strength dose of vitamin C.
Pluots(Image via Palomar.edu)You like plums? You like apricots? Of course you do. Well combined they form the genetically modified powerhouse known as the pluot. Described by WiseGeek as __an intensely flavored fruit_, pluots are heavily fortified with vitamin C and have no sodium or cholesterol. 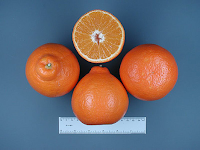 Tangelo(Image via TeamSugar)__Should I have a tangerine or a grapefruit?_ No longer need this question be asked! Lovers of each fruit can now get the best of both worlds with this sweet hybrid, which boasts a ton of fiber, vitamin C, and a slightly tart taste! Colorful carrots(Image via MSNBC)Could colorful, genetically-modified carrots like those pictured here be the secret to absorbing more calcium? Two Texas researchers say yes – and they__ve created a carrot they claim allows people to absorb 40% more calcium than normal carrots to back up their claims! And best of all, no more boring orange! Diabetes-fighting lettuce(Image via FloridaTrend)Diabetes is one of the most frustrating and life-threatening illnesses out there. Living with it (at minimum) means daily, sometimes painful insulin injections – until now. 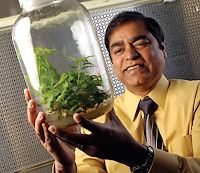 University of Central Florida professor Henry Daniell has created a genetically modified strain of lettuce (pictured above) that carries the insulin gene. The lettuce cells protect the insulin on its journey through the digestive tract, and when the insulin reaches the intestines, the body__s natural insulin-producing response is triggered. Lematos(Image via FreeWebs)Okay, so it’s possible no one would want it or eat it, but that didn__t stop Israeli researchers from bringing us the Lemato! Unlike other genetically altered fruits and veggies (which were created primarily for health reasons), it appears that the lemato was solely an experiment to determine if it was possible to make tomatos give off the scent of lemons. Hat tip to notoriouslyconservative.com and web ecoist. FREE HUGS . anda mau ?? ?